Despite any stereotypes that are out there about magicians, not all of them wear top hats and tails or have shapely assistants in sparkly costumes - nor do all magicians sound alike when performing magic. One thing they do have in common is PATTER, the script they go by when performing a trick, even when that script is silence. Patter is a big part of magic - after all, what exactly do you say when you are doing a card trick? “Pick a card, any card” is a great example of patter - even if a bit over done. At its most simple patter is simply the words being spoken and the direction being given during a trick. It can be as simple or complex, as straight forward or as dramatic as the magician chooses to best perform the trick at hand. Instructional patter is simple, straight forward and effective. Music often tells a story and some of the best stage performances are done to music. David Copperfield produced many TV specials where acts were put to music to great affect. 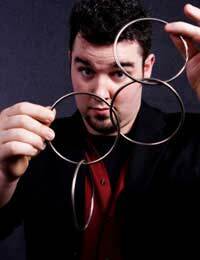 Some magic routines, such as the linking rings, are often improved by using music and little to no words. If the routine you are planning is flashy, lasts more than a few minutes, or tells a story in itself, consider setting it to music. When a magician weaves a story as he performs magic, playing cards become cops and robbers, coins become ships and billiard balls become planets. The trick itself is a story of sorts and ultimately the point of a trick is to entertain, so Story Telling Patter often goes hand in hand as a perfect match with magic. What kind of story you tell depends on the trick you are performing, your audience and you. You could tell as story about “When I first learned this trick” and walk through your experience watching it performed by another magician - all the while your fingers do the trick and amaze your audience. In the end, the kind of patter you pick will vary from trick to trick. You may have learned a set patter when you learned the trick (these are often of the Instructional variety) and stick with it because it helps you recall the steps to the performance. On the other hand you may take a trick that is fairly common and add a wrinkle to it with a creative story. You may certainly mix it up as well, either blending patter styles or alternating from trick to trick. One final word on patter - it does not serve only to entertain, but also to misdirect. Listening to a story about four crooks trying to evade capture will take the audience mind off of the cards in your hand and what you are doing with them as they watch and listen for the resolution of the story.